The idiosyncrasies of language can tell us a lot about a culture. 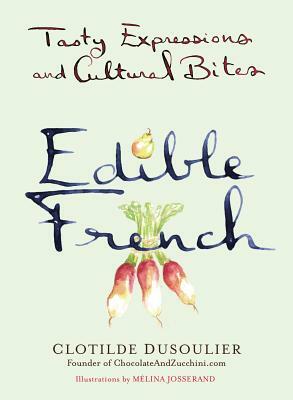 In this delightful book, Clotilde Dusoulier, creator of the award-winning food blog Chocolate & Zucchini, delves into the history and meaning of fifty of the French language’s most popular food-related expressions. A treat of a read for Francophiles and food lovers alike, Edible French is the tastiest way to explore French culture—one that will leave you in high spirits—or, as the French say, vous donnera la pêche (give you the peach). Clotilde Dusoulier is the thirtysomething Parisienne behind the award-winning food blog Chocolate & Zucchini, in which she shares her passion for all things edible. Her focus is on fresh, colorful, and seasonal foods, making room for both wholesome, nourishing dishes and sweet treats. An enthusiastic explorer of flavors and acute observer of culinary trends, she contributes to food and travel magazines around the world, and has authored cookbooks and a guidebook. She lives in Paris, in the Montmartre neighborhood, with her boyfriend and their young son. Mélina Josserand is a mother of four, a full-time lawyer, and a watercolor artist. Born and raised in France in the back of an antiques gallery, she now lives and works in London.